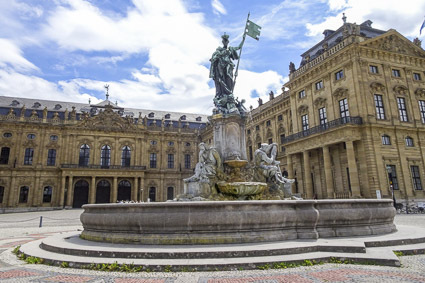 The Residence, which was built between 1720 and 1744, served as the palace of Würzburg's Catholic prince bishops from the 18th Century until they were kicked out of power in 1806. 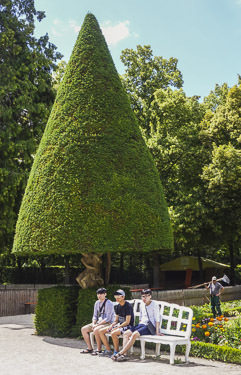 Its most notable feature is a vast ceiling fresco by the Venetian artist Giovanni Battista Tiepolo. 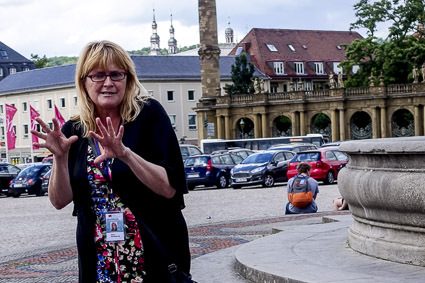 Our tour began at the Franconiabrunnen, or Franconian Fountain, on the Residenzplatz. 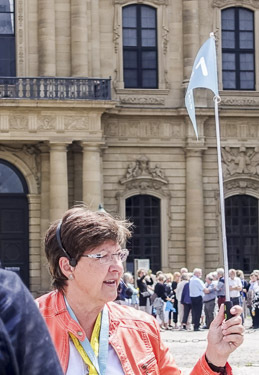 Our tour guide warned us that we couldn't take photos inside the Residenz, so--to borrow a phrase from Victorian novelists--a veil descended upon the scene as we entered the building. 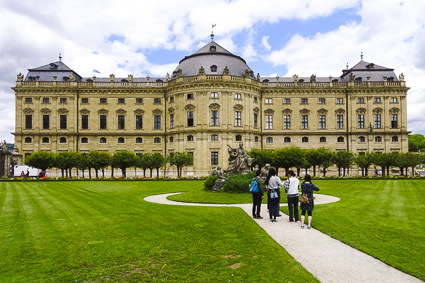 After touring the Residenz, we visited the gardens behind the palace. 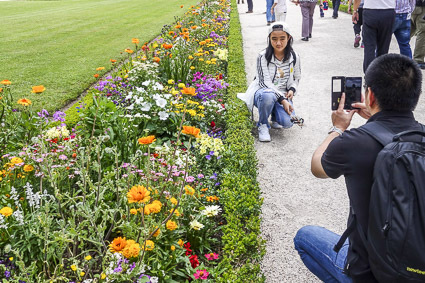 The gardens were filled with flower beds and visitors. 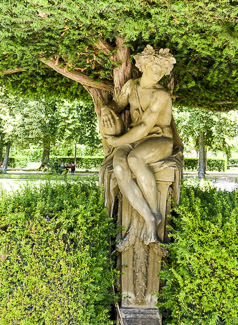 The topiary in the gardens held a surprise: statues that were intertwined with the tree trunks. 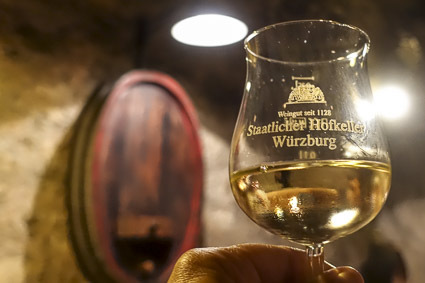 We'd signed up for an optional wine-tasting in the Staatlicher Hofkeller next to the Residenz, so we reported to our wine guide at the Franconiabrunnen at 2:30 p.m.
Next, we crossed the street and descended a staircase into a warren of vaulted cellars lit by candles. 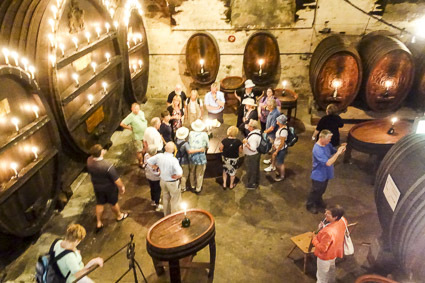 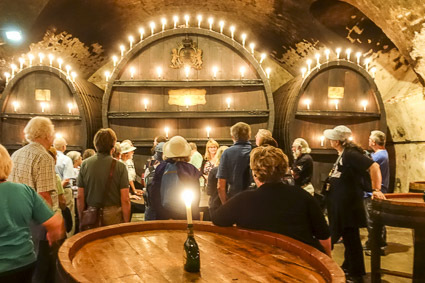 With our fellow oenophiles, we gathered in front of huge casks while our guide supplied an historic overview of the former Prince Bishops' wine cellars. 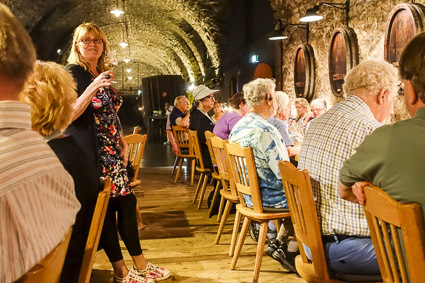 Next, we were led to a cellar with tables where we sat for the wine-tasting. 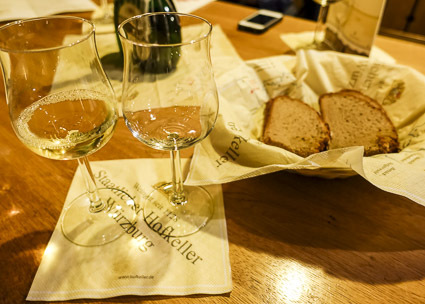 Wine glasses and rye bread were waiting for us. 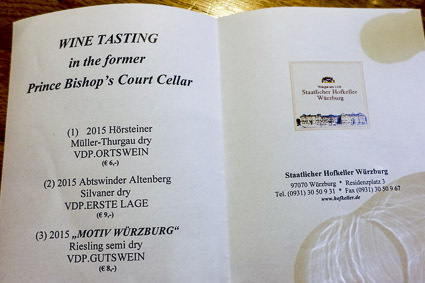 A menu listed the three Franconian white wines we'd be sampling: a Müller-Thurgau (dry), a Silvaner (dry), and a Riesling (semi-dry).